Eylure Party Perfect Gorgeous Evening Wear Lashes MOONLIGHT has a full and blunt cut look. These black lashes is a gorgeous finishing touch to any outfit, Party Perfect have been designed to complement after dark fashion. From elegant dinners to cool clubs, great gigs to A-list parties- these eight exqistely designed lashes could be the only accessory required. Eylure Party Perfect Gorgeous Evening Wear Lashes PITCH DARK are lengthy, full lashes. Add these to your natural lashes for a gorgeous evening look! Eylure Party Perfect Gorgeous Evening Wear Lashes STARLIGHT are full lashes with medium length and a sprinkling of glitter. Add these to your natural lashes for a little sparkle to your party attire! 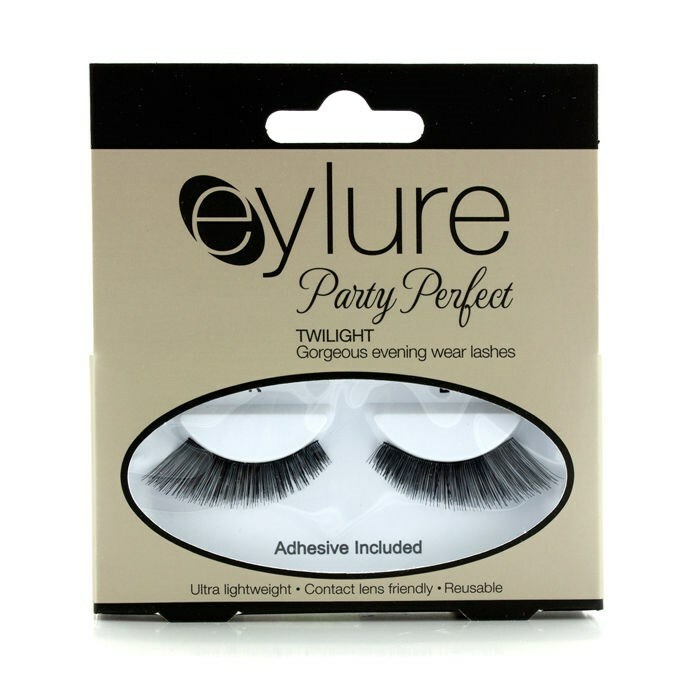 Eylure Party Perfect Gorgeous Evening Wear Lashes TWILIGHT (6091304) are full, angled lashes. Add these to your natural lashes for sassy party eyes! Eylure Lashfix Strip Lash Adhesive (Dark Tone, 8.5ml) is a long lasting adhesive that dries quickly and is safe and effective. Please note Eylure Lashfix Adhesive (Black Finish) has been discontinued and is no longer available. Try comparable adhesive in DUO Eyelash Adhesive (1/4 oz) Dark and Revlon Precision Lash LATEX Adhesive (91167). Eylure Lashfix Strip Lash Adhesive (Clear Tone, 8.5ml) is a long lasting adhesive that dries quickly and is safe and effective. Please note Eylure Lashfix Adhesive (Clear Finish) has been discontinued and is no longer available. Try comparable adhesive in DUO Eyelash Adhesive (1/4 oz) Clear and Revlon Precision Lash Adhesive Glue (91321).